Chicago may be the original home of Second City, but when it comes to celebrating with the Stanley Cup, it's second to none. 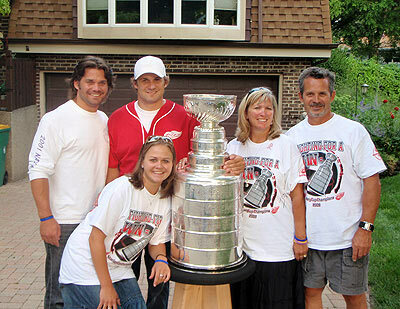 Both Brett Lebda and Chris Chelios spent time in Chicago with Lord Stanley's legacy. Buffalo Grove, Illinois is a suburb of the much larger Chicago. For a town of 43,000, they've bred two pretty fine young defencemen  Andy Wozniewski of the St. Louis Blues and Stanley Cup champion Brett Lebda of the Detroit Red Wings. Brett was born in raised in Buffalo Grove and is a proud alumnus of Notre Dame. Following his fourth season with the Fighting Irish, he was signed as a free agent by the Detroit Red Wings, and joined the team for 46 games in 2005-06. In fact, in his first game, on October 5, 2005 (opening night of the season), Lebda registered his first NHL goal. The Stanley Cup arrived in the Chicago area on August 21, and Brett was excited. So respectful of the Cup and its heritage, the young Illinoisan was only too proud to take it first to C&A Auto Body to show his father. His Dad beamed as the guys in the shop got their pictures taken with the Stanley Cup. 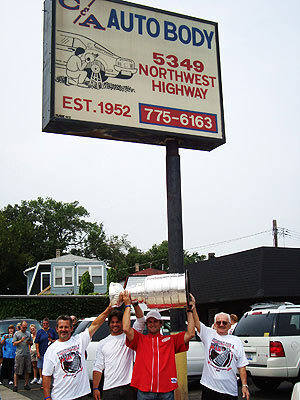 An SUV limousine pulled up, and with the Stanley Cup, Brett had the driver take them to the Glenview Ice Center, where he had played hockey as a kid. He was all set for the day and had dedicated all of his fundraising efforts to be funnelled to juvenile diabetes, which his sister had battled through her childhood. T-shirts were produced for sale and photos and autographs were sold for donations to this wonderful charity. Fans filled the arena, anxious to have their moment with the Red Wing defenceman and the Stanley Cup. Among the people in attendance was his former coach, who helped to organize the event. It was a drizzly day, and like an old faucet, the water stopped and started all day. Unfortunately, the day seemed to clear up when Brett was indoors, but the skies opened the second he stepped outside with the Stanley Cup. Such was the case after his visit to the Glenview rink, but Brett simply shrugged and darted into the limo, which took him to the home of his parents. After a few photographs, he was off for his home, a wonderful spot on the water in Buffalo Grove. After dinner, Brett's plan was to take friends and the Stanley Cup by pontoon boat to the Horizontal Bar. Of course, as they boarded the boat, the rain fell like the Penguins in the final. No harm, the party had begun and no one seemed to mind, least of all Brett Lebda. Once at the bar, the evening furthered the fundraising by holding auctions (silent and otherwise), raffles and offering pictures and autographs, all for the benefit of juvenile diabetes. At 1:30AM, the Cup was returned by pontoon boat to Brett's house. The buddies all felt like having something to eat, so Brett Lebda's celebration ended with friends eating cereal out of the Stanley Cup. 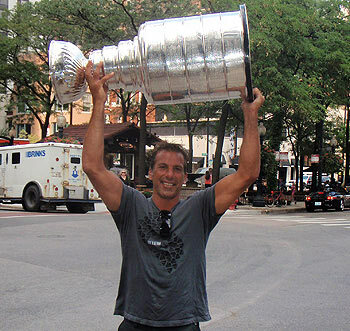 Winning the Stanley Cup is nothing new to Chris Chelios, who was part of championships with Montreal in 1986 and Detroit in 2002, but it never gets tired (just like Chelios himself!) The Methuselah of Motown just completed his 23rd NHL season, and turned 46 in January of last season. And yet, physically and mentally fit, the oldest player in the NHL will return for a 24th season in 2008-09. 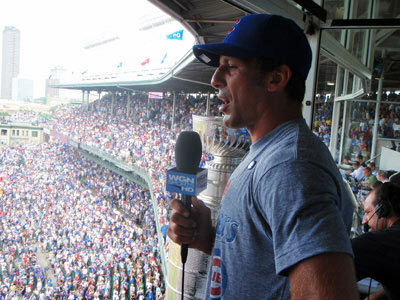 Chelios, who was born in Chicago, enjoyed the Stanley Cup again on Friday, August 22. Meeting the Cup at the Sutton Place Hotel, right in the Windy City's busy core, Chris was joined by some close friends, who grabbed coffee and a bite to eat, then had photos taken with the Stanley Cup. The group took the Stanley Cup out onto the streets of Chicago, stopping first at Gibson's Steakhouse, then The Whiskey. Along the way, they stopped as random people stood in disbelief at seeing Chris Chelios with the Stanley Cup. 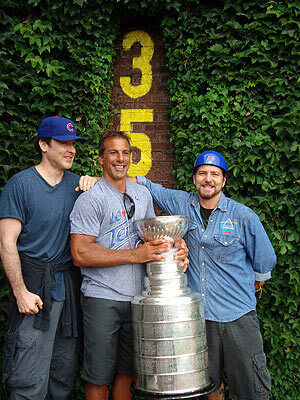 A bus picked up Chris, hockey friends Ethan Moreau and Sheldon Souray, actor John Cusack and Pearl Jam's lead singer Eddie Vedder, among others, and with the Stanley Cup in tow, zoomed off to Wrigley Field, where Chelios was to throw out the ceremonial first pitch. A rain delay pushed back the start of the game between the Cubs and the Washington Nationals, so Chris walked out onto the field so fans could get pictures of the Cup. "Chris! Chris," shouted the fans, snapping pictures with their phones. The delay was lengthy, so the entourage exited to Murphy's Bleachers, the famous sports bar across the street from the ballpark. Inside, the place was bedlam, and the chaos was more pronounced once the Cup and a Stanley Cup champion entered the building. Chris served drinks and made it memorable for everyone. Back at the diamond, the weather cleared enough to initiate the game. Chris laughed, recalling how the last time he threw a ceremonial pitch, it sailed over the catcher's head. Just in case, he took out two balls to the mound once his name was announced. With rocker Eddie Vedder catching, Chris rubbed the ball, wound up, and sailed the pitch high over Vedder's head. He picked up the second ball for a second try, reared back and fired, sending another ball well over the catcher's head. "Ah Eddie, you're a shorter catcher than I'm used to throwing to," Chris laughed. After doing a radio interview, Chris led the crowd in a rendition of 'Take Me Out to the Ball Game' during the seventh inning stretch. The Cubbies should have known that Chris's opening pitch was a precursor of things to come  they got spanked 13-5 by the Nationals. Making certain he showed no preference, Chris then jumped back on the bus with the Cup and his friends and headed for Comiskey Park so he could throw out the first pitch at the White Sox game versus the Tampa Bay Rays. But, nature called and there was no washroom on the bus. With traffic dense and few other options, Chelios bellowed, "Stop the bus, I've got to pee!" Looking around, Chris saw a group of neighbours enjoying a barbecue on their front lawn. The light bulb went on. Grabbing the Stanley Cup, he ran over to the folks and struck a deal: "Listen, if you'll let me use your washroom, I'll let you and your friends have their pictures with the Stanley Cup." "Wow," said the homeowner. "Bathroom's inside and to the left." In went Chris, and it was such a great idea that each of the guys on the bus followed suit. A parade led from the bus, past the barbecue to the washroom while the folks on the lawn snapped picture after picture with the Stanley Cup. "Damn, you're John Cusack," blurted one woman, and although he sheepishly agreed that he was, he was third in line for the washroom and didn't want to lose his spot. The Chelios delegation, feeling refreshed, joined the friendly folks for a sausage before climbing back on the bus for the White Sox contest. As the bus door closed, the cellphones snapped open. "You will never in a million years guess what just happened to us ..."
At Comiskey, the gang disembarked for the clubhouse. 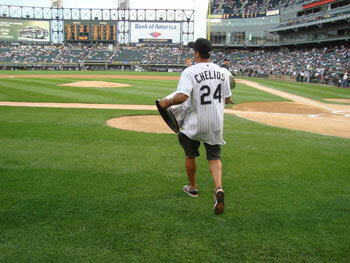 The White Sox had a jersey there for Chris, all prepared with 'Chelios' sewn onto the back. Pulling the jersey on, Chris waved to the crowd as he walked to the pitcher's mound. Introduced by the P.A. announcer, Chris rolled the ball around in his palm, stared at the catcher's mitt, leaned back and fired a strike. Didn't seem to help though  the Rays dumped the hometown boys 9-4 with Chelios and his friends looking on from a suite. So there is another first  the Stanley Cup in the crowd during a recorded live music performance! Following the show, the Stanley Cup made an appearance at Stanley's Bar. Clearly the worst-kept secret in Illinois, the bar was crowded to overflowing, waiting for Chelios to arrive with his silverware. Chris served drinks from behind the bar and the crowd revelled in the appearance. "Awesome time," announced Chris at 2:30, and with that, the night concluded, and the Stanley Cup prepared for its next celebration. Kirk Maltby takes his turn with the Cup, and the Stanley Cup Journal will tell you all about it on Tuesday. All Photographs are property of the Hockey Hall of Fame or Getty Images and may not be reproduced without prior written consent. For more information regarding use of our photographs please contact us. >> View videos straight from the Keepers of the Cup!